News-Yongkang Gomax Industry and Trade Co.,Ltd. A study by Professor Li Lihua from the School of Basic Medicine of Jinzhou Medical University proved that hydrogen water has obvious effects on preventing age-related macular degeneration in animals. This study was published in the journal Free Radical Biomedicine in February 2019. The main function of the retina is to sense and transmit vision. The area of the center of the retina with a diameter of about 2 mm is called the macula, which is named after the area is rich in lutein. There is a small concave in the center of the macular fovea, which is the most sensitive part of the retina. The retina is the thinnest, and the light information is the most accurate. Age-related macular degeneration, also known as age-related macular degeneration (AMD), is an aging change in the structure of the macular area. The main manifestation is that the retinal pigment epithelial cells have a decreased ability to phagocytosis and digestion of the extracellular disk membrane. As a result, the residual membrane bodies that have not been completely digested are retained in the basal cell plasma slurry and discharged to the outside of the cell, and deposited on the Bruch membrane. Forming a glass film crucible. Due to the abnormal structure of the neovascular wall, blood vessels leak and hemorrhage, which leads to a series of secondary pathological changes. Age-related macular degeneration mostly occurs in people over the age of 45, and its prevalence increases with age, which is an important disease for blindness in the elderly. It is an important cause of blindness in the elderly in developing countries, and this disease has a serious impact on the quality of life of the elderly. The US FDA-approved drugs are only effective for 10-15% of wet macular degeneration, and there is no specific treatment for most patients with dry macular degeneration. It is therefore highly desirable to find ways to treat the disease. There are many causes of age-related macular degeneration, and the pathophysiological process of this disease is also complicated. Under normal physiological conditions, the cones of the macula and the pigment epithelial cells cooperate with each other. The outer disc membrane, which is detached from the cells every day, is phagocytized, digested and excreted by the pigment epithelial cells to maintain the metabolic balance inside and outside the cells. Various factors that can cause oxidative damage to retinal tissue can cause macular degeneration. For example, ultraviolet light and blue light in the light react with oxygen in the blood or hyperglycemia, hyperlipidemia, increased peroxygenation and other causes of free radicals in the retina and blood vessels, and glutathione and superoxide dismutase in the body cannot be completely Excessive free radicals are completely eliminated. At this time, oxygen free radicals oxidize and damage the cone cells and the detached outer disc membrane, causing the cone cells to die and the outer disc membrane to degenerate. Numerous studies have shown that aging itself is an important factor leading to macular degeneration. Cell senescence is closely related to oxidative stress. Oxidative stress leads to inhibition of gene expression, and the basic physiological functions of DNA repairing damaged cells cannot be performed, leading to cell aging and tissue damage. Sirt3 is a member of the acetylase sirtuins family. Studies have shown that Sirt3 has multiple biological functions, is involved in the regulation of oxidative stress, energy metabolism and protection of mitochondrial function, and participates in the development of various chronic age-related diseases such as diabetes, cancer and macular degeneration. . Sirt3 is abundantly expressed in the retina and is an important cellular signal in the inner and outer nuclear layers of the ganglion cell layer. Although it has been reported in the past that the retina expresses Sirt3 high, the function of this protein in the retina has not been fully studied. Hydrogen was once considered a physiologically inert gas, but has been shown to have selective antioxidant effects in recent years. Hydrogen can selectively neutralize highly toxic free radicals and does not affect active oxygen with physiological functions. Drinking hydrogen water is a viable method of supplying hydrogen. Using this method to give hydrogen can produce anti-inflammatory, anti-oxidative, anti-apoptotic effects, animal models and clinical studies have proved that hydrogen water drinking can have a therapeutic effect on a variety of diseases. There are also some studies in ophthalmology diseases. For example, it has been found that hydrogen water has certain therapeutic effects on retinal vascular proliferation, diabetic retinopathy, retinal ischemia-reperfusion injury, retinal photodamage, and corneal chemical burn. Considering the relationship between aging and oxidative stress, this study focused on the effect of hydrogen as an anti-aging molecule on the protection of Sirt3 expression and oxidative stress levels in the retina-related protein. The study used NaIO3, a widely used model of age-related macular degeneration. This study found that hydrogen can reduce the typical pathological changes in the retina of mice caused by NaIO3. At the same time, hydrogen water can reduce the retinal reactive oxygen species and typical changes in oxidative stress. 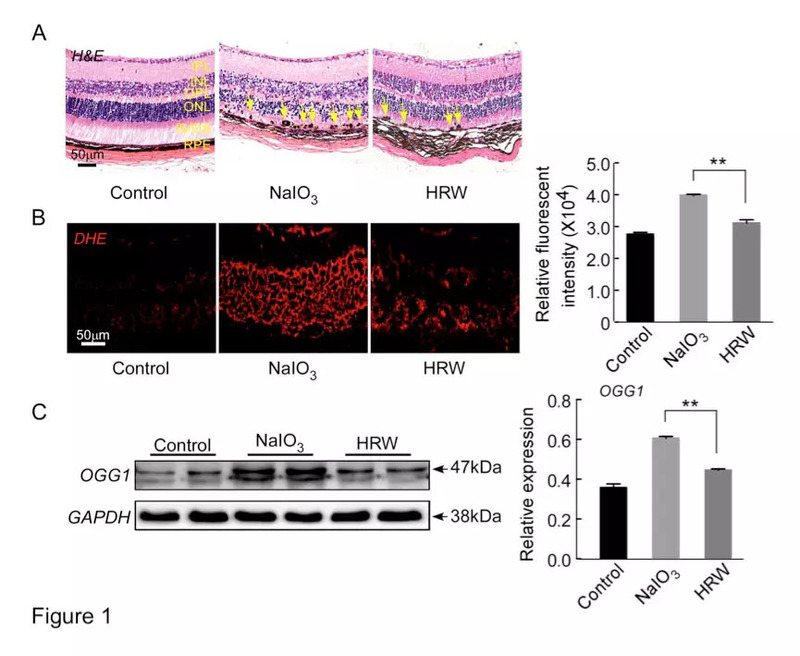 These results indicate that hydrogen can reduce NaIO3-induced retinal oxidative stress in animals, and the effect of hydrogen by another antioxidant, ALCAR, was also verified. Mechanism analysis revealed that hydrogen significantly reversed Sirt3 expression and activity inhibition. Hydrogen can also reduce the expression of p53, p21 and p16. The study also found that hydrogen can reduce DNA damage-associated protein ATM, cyclin D1 and inflammatory regulatory protein NF-κB, but can increase the DNA repair-related protein HMGB1, suggesting that hydrogen can inhibit NaIO3-induced changes in mouse retinal cell senescence. Optical coherence tomography (OCT) results show that hydrogen can inhibit the formation of high retinal reflex and protect the retina from thinning. ERG analysis also found that hydrogen can protect NaIO3 induced a and b amplitude decrease. The results suggest that hydrogen does inhibit typical changes in retinal aging, including downregulation of Sirt3 expression and enhanced oxidative stress. Considering that hydrogen is very easy to obtain, it has no toxic effect on human body, and it has various advantages in using ophthalmic diseases. The potential therapeutic value of hydrogen for age-related macular degeneration is highly valued in the field of clinical ophthalmology. Research in this area will bring new hope to elderly blind patients.